Chimpanzees from African sanctuaries carry drug-resistant, human-associated strains of the bacteria Staphylococcus aureus, a pathogen that the infected chimpanzees could spread to endangered wild ape populations if they were reintroduced to their natural habitat, a new study shows. 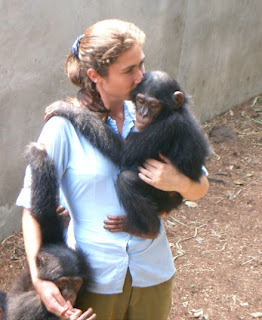 Young, motherless chimps need close contact. The study by veterinarians, microbiologists and ecologists was the first to apply the same modern sequencing technology of bacterial genomes used in hospitals to track the transmission of staph from humans to African wildlife. The results were published today by the American Journal of Primatology. Drug-resistant staph was found in 36 chimpanzees, or 58 percent of those tested at two sanctuaries, located in Uganda and Zambia. Nearly 10 percent of the staph cases in chimpanzees showed signs of multi-drug resistance, the most dangerous and hard to cure form of the pathogen. “One of the biggest threats to wild apes is the risk of acquiring novel pathogens from humans,” says study co-author Thomas Gillespie, a primate disease ecologist at Emory University. The study was led by Fabian Leendertz, the head of emerging zoonosis at the Robert Koch Institute in Berlin. Other co-authors were from the University Hospital Munster in Germany, the Ngamba Island Chimpanzee Sanctuary in Uganda and the Chimfunshi Wildlife Orphanage in Zambia. Antibiotic resistance is rare in wild apes, with only one case of drug-resistant staph ever identified in them, Gillespie notes. That’s a stark contrast to ape sanctuaries, where necessary close contact with human caretakers promotes cross-species pathogen transmission. Multi-drug resistant staph is a major human health problem, causing an estimated 94,000 life-threatening infections and more than 18,000 deaths annually in the United States alone. It’s unclear the magnitude of the effect the disease could have if accidentally introduced to populations of naïve wild apes. The researchers hope that their findings influence the policies at ape sanctuaries, since many of them are under growing pressure to reintroduce rescued animals to the wild. The prevalence of drug-resistant staph in sanctuary chimpanzees may also pose a risk to humans, Gillespie says, due to the close genetic relationship between primates and people. “The chimpanzee may serve as an incubator where the pathogen can adapt and evolve, and perhaps jump back to humans in a more virulent form,” he says. The booming human population in sub-Saharan Africa, and the resulting overlap of human activity in wild primate habitats, increases the risk of such cross-species transmission of pathogens, the researchers warn.